For our honeymoon in 2000, my wife and I went on a 7-night Caribbean cruise on the Disney Magic cruise ship. In 2007, my extended family (including my wife, son, and my parents and sister) took a 4-night Bahamas cruise on the Disney Wonder. Both trips were great fun and made us into big fans of the Disney Cruise Line. 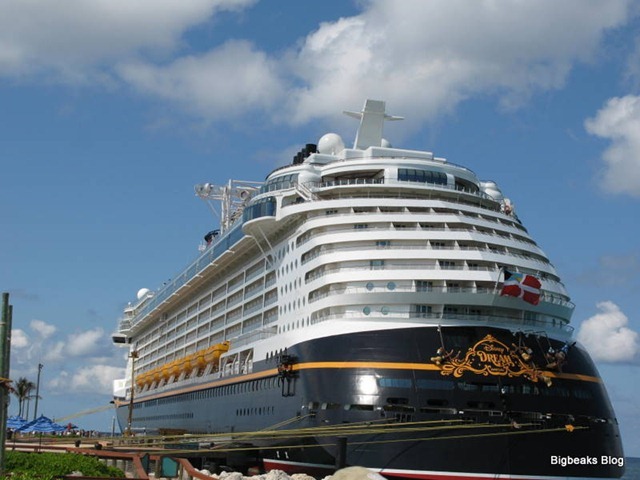 When Disney announced that the Disney Dream, the first of two new, larger and more advanced ships, would debut in 2011, we booked another 4-night cruise as soon as they became available. While the maiden voyage was in late January, my son’s school schedule meant that the April 17th sail date, during his spring break, was our first opportunity. I was able to book a family stateroom with verandah on deck 7, using points from our Disney Vacation Club timeshare to cover the cost. The itinerary was the same as our 2007 cruise, with stops at Nassau and Castaway Cay, Disney’s private island, plus one day at sea. The extended family was unfortunately unable to join us this time, so it was just my wife, 7-year-old son and me. Due to the travel time (plus the 3-hour time change) from our home in Southern California to Port Canaveral in Florida, it was necessary for us to fly in the day before the cruise. Since we have family in the Orlando area, we generally do annual trips out there. For the last several years, we have been traveling on Delta, which has conveniently scheduled direct flights from LAX to Orlando International. This year, we also had enough frequent flier points to get one of the tickets for free, reducing the cost by quite a bit. Our experience with Delta wasn’t really the best this time and I expect that I’ll be looking closely at alternatives for the next trip. The biggest issue was that they lost all of our luggage on the flight home and then took nearly 24-hours to get it to us. I’m just thankful that this happened on the return flight. It could have been a massive problem had they lost it on the flight to Florida instead. Delta has also been slow to upgrade their planes to the latest conveniences. Neither the flight to Florida or the flight home offered seat-back entertainment systems or, for that matter, any in-flight entertainment at all. There wasn’t even a movie. While the planes did have wi-fi Internet connectivity available, the seats are so closely spaced that we didn’t even bother to try using our laptops in. They also don’t offer any power at the seats for charging batteries. These types of improvements are pretty much standard on newer airlines like Virgin America and Jet Blue. Finally, Delta just isn’t all that competitive in price anymore. In the past, I have often found them to be the cheapest choice or only marginally more expensive than non-direct flights on other airlines. Delta’s prices have gotten higher, plus they now charge extra for all checked luggage and any food items more substantial than peanuts or pretzels. When I did price comparisons for this trip, I found that even with the one frequent flier reward ticket, the airfare for the three of us was only slightly cheaper than some of the more bargain priced airlines, particularly Southwest. The night before our 2007 cruise, we stayed at a Walt Disney World resort (Saratoga Springs) and then took Disney transportation to the port. We found that to be a somewhat frustrating experience, as the bus didn’t get us to the port until around 2:30 in the afternoon. My parents and sister had driven themselves to the port, which resulted in us getting phone messages that they were having a leisurely lunch on the ship while we were still sitting in front of the hotel waiting for the bus. We hated losing out on those first couple hours when we could have been onboard the ship.